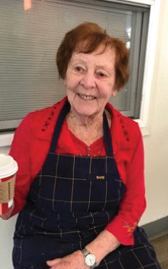 Margie Popp, COTS’ longest-serving volunteer and Lead Cook for lunch on Tuesday, Wednesday, and Thursday! Margie has lived in Petaluma for all 94 years of her life. In 1945 she started working as an ‘office girl,’ 45 hours a week, earning 17 cents an hour. Margie worked for that same company for 38 years, before retiring in the 1980s. When did you start volunteering at COTS? Margie has been with COTS since the beginning. In 1982 a flood left many in Petaluma homeless and Margie started volunteering at a kitchen in the old fire station to help serve those in need. Eventually the kitchen became COTS and Margie continued helping there until the Mary Isaak Center was built. Why did you choose to volunteer at COTS? It’d be more accurate to say COTS chose Margie. COTS evolved out of the kitchen she was volunteering at and Margie stayed on. One day, the lead cook told Margie that she was leaving, and Margie was in charge now – and she’s been a lead cook ever since. What do you like most about volunteering here? Margie says the people, clients and volunteers, keep her coming back. There’s never a dull moment! If you see Margie be sure to thank her for all her decades of volunteering and service to others!